Murdoch Mysteries: Christmas Cases Collection - BUY THIS DVD! 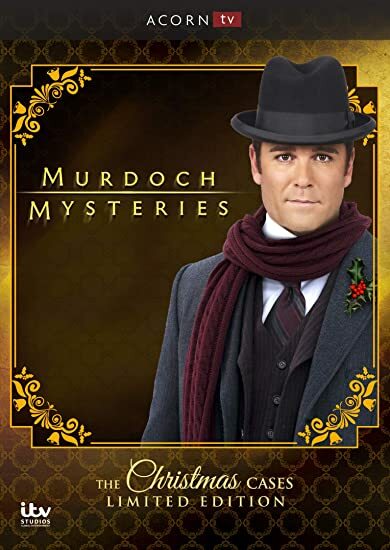 Detective William Murdoch (Yannick Bisson, Sue Thomas: F.B.Eye) and his team solve yuletide crimes in these three feature-length mysteries set in Edwardian Toronto.<br><br>A Merry Murdoch Christmas—At a charity gala, Murdoch and his wife, Dr. Julia Ogden (Hélène Joy, Durham County), find the host dead from a broken neck; Inspector Brackenreid (Thomas Craig, Coronation Street) suspects the culprit is the legendary Christmas creature Krampus. Once Upon a Murdoch Christmas—When Murdoch investigates a daring robbery where the culprit seemed to possess superhuman abilities, Constable Crabtree (Jonny Harris, Still Standing) realizes the robber resembles a character from his novel.<br><br>Home for the Holidays—Murdoch and Julia travel to British Columbia to visit Murdoch's brother (Dylan Neal, Dawson’s Creek), but instead of a family holiday, they end up investigating a murder at an archaeological site.<br><br>Guest stars include Brendan Coyle (Downton Abbey), Kelly Rowan (The O.C. ), Megan Follows (Reign, Anne of Green Gables), Kate Hewlett (The Girlfriend Experience), Jake Epstein (Degrassi: The Next Generation), and Ed Asner (The Mary Tyler Moore Show, Up). THEN SEND IN YOUR NAME AND ADDRESS TO contests@efilmcritic.com. Put "I BET THE GRINCH DID IT" in the subject line and cross your fingers. We will draw names and one of the DVD packages from Acorn Media could be yours. Only 1 entry per household.